Infinity Countdown #4 review: Which dimension are we in? – AiPT! Infinity Countdown #4 review: Which dimension are we in? As in many mini-series, there is a lull in the center of the story. Infinity Countdown #4 is that spot. Since we are well on our way towards the new Infinity Wars, with the latest teaser covers declaring “Death Wins!” I think it is high time we address the most controversial thing happening in Infinity Countdown: Star-Lord’s blonde beard. I’m working to read through some of Infinity Countdown and that isn’t a good thing. I enjoy the opening tease with the dwarf creating some new weapon/armor/head for the mysterious Requiem in each issue. There are some clear parallels to a recent film some of you might have seen, which is where I think my own problem begins. I don’t have a long history reading Guardians of the Galaxy or Nova, so my vision of these characters is pretty much based on the Marvel Cinematic Universe. It is truly odd to see Gamora with the yellow circles around her eyes and Star-Lord being as blonde as an old-school Thor wannabe just makes me feel like he took the whole angel-pirate thing a bit too hard. But, enough of my own shortcomings. I’m distracted in reading the book. Truly. While the story works well, I’m distracted by the art. I’m not sure which of the two artists is responsible for the main story of the book, but Aaron Kuder and Mike Hawthorne have such drastically different styles that even the Cast page looks odd. One shows an amazing attention to detail while the other’s work simply falls flat and looks cartoony and incomplete. After four issues of this pre-event series, I think there’s been enough to show that it is not a fluke, nor is it even about differing storylines having different artists. Groot has changed dramatically since the first issue, losing a lot of detail in the process. There are some very, very interesting story developments from writer Gerry Duggan, primarily in discovering that some of the Infinity Stones may not be what we all think they are, and in an enormous personal sacrifice that will certainly alter the galaxy for a long time to come, regardless of the outcome of the upcoming Infinity War. As in many mini-series, especially those leading up to a larger event, there is a lull in the center of the story where pieces must be moved into place, stories must be sorted, plots must be plotted. Infinity Countdown #4 is that spot. I’m looking forward to seeing where we go from here. There are some very, very interesting story developments from writer Gerry Duggan, primarily in discovering that some of the Infinity Stones may not be what we all think they are, and in an enormous personal sacrifice that will certainly alter the galaxy for a long time to come, regardless of the outcome of the upcoming Infinity War. As in many mini-series, especially those leading up to a larger event, there is a lull in the center of the story where pieces must be moved into place, stories must be sorted, plots must be plotted. 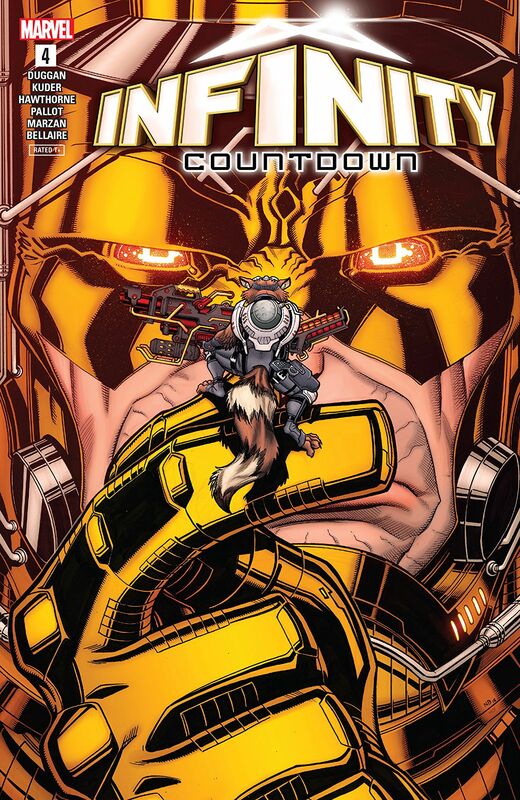 Infinity Countdown #4 is that spot. I'm looking forward to seeing where we go from here. Drax and his Sax. Can we name it Sax the Destroyer?